Following the overwhelming success of our trip in 2018, which raised over £9000 for Macmillan and was enjoyed by many shipmates, we will once again in 2019 take to the seas around our coastline for the trip of a lifetime. Imagine sailing around our wonderful coastline, enjoying the ever-changing scenery and wildlife, experiencing the challenges of tidal currents, rocks and sand banks, and entering our many historical ports from the sea. And imagine at the same time, being part of a fundraising venture for Macmillan Cancer Support. Most of us will come into contact with cancer at some time in our lives and Macmillan, as many of us know, are there to help and support both the patient and their family. It is our personal experience of the superb care and support provided by Macmillan that has lead us to run this trip. Our yachts will visit all of the marinas operated by the Yacht Haven Group, and at least one marina operated by Quay marinas. These marinas have agreed to waive their fees and hold a Macmillan fundraising event. After a gentle sail to the historic port of Harwich and Shotley Marina, this leg will sail north to Lowestoft before setting off on the long, 24 hour passage to Whitby (the inspiration for Bram Stoker’s Dracula and the departure port of Captain Cooke’s ‘Endeavour’). The final destination on this leg is the River Tyne, where the staff at the Quay Marina in South Shields look forward to welcoming you. What better way can there be of seeing British wildlife than by sailing to the Farne Islands? Seals, puffins, guillemots and razor bills are just some of the birds living on these waters. After anchoring in the lee of Lindisfarne Castle, you will sail over the Border to the fishing port of Arbroath (and sample delicious Arbroath Smokies). There will be a couple of long sails on this leg, but a must-see stop is the little village of Whitehills, before making your way to Inverness and the Caledonian Canal. Sailing alongside mountains, high above sea level, is a unique experience. Starting at Inverness you will rise up through the lock system and traverse this world-renowned feat of engineering that is the Caledonian Canal, linking the natural lochs of Loch Lochy, Loch Oich, Loch Ness and Loch Dochfour, and including the famous ‘Neptune’s Staircase’. This is a relaxing week cruising some beautiful inland waterways. After visiting the beautiful Island of Kerrera, the sail to Crinan passes the islands of Jura and Scarba (and the famous Correyvechan – don’t worry, we will see it from a distance!) where you will negotiate the sea lock and the self-operated locks of the Crinan Canal. Then on to the wonderful Clyde Estuary calling at Largs and anchoring at Arran before arriving at Troon. Following a visit to the picturesque fishing harbour of Portpatrick (a journey back in time) our route will take in the historic Cumbrian town of Whitehaven before crossing the Irish Sea to Ramsey on the Isle of Man and then a long sail down the coast to Milford Haven and Neyland Marina. First stop will be Padstow, a lovely port where the Harbourmaster promises a warm welcome. The journey to Padstow involves crossing the Bristol Channel with its very strong tides and busy shipping and where we may anchor at Lundy Island to watch basking sharks or porpoises. After rounding Land’s End we will explore the beauty of the Cornish coast, arriving in historic Plymouth Yacht Haven for a lunchtime BBQ. The final leg of our journey and a visit to Brixham followed by a long sail to Weymouth, passing Portland Bill and its famous race, before stopping at Lymington Yacht Haven – to get our breath back. From Lymington it is a pleasant day sail to Brighton for an overnight stop before continuing to our home port of Fambridge where the Yacht Haven staff promise a warm reception. No previous sailing experience is required, as our fully-qualified RYA instructors will skipper each part of the voyage. You will have an opportunity to learn and develop a range of boat handling, navigational and watch keeping skills to suit your sailing level and experience. As with any voyage, you will be invited to help with the day-to-day jobs of cooking and keeping the boat clean. Each leg is priced at £749 per person, or you may wish to undertake the entire seven-week trip which costs £4710. The price is for full board (probably the best food afloat) and includes all fees, food on board, oilskins, fuel/gas etc. The only extra would be entertainment/meals ashore and getting to and from the boat. All changeover ports have good transport links by train or air. This contract is made between Premier Sailing Limited (the Company) registered in England, and any person(s) (the Client) booking with Premier Sailing Limited to take part in any event, charter, training course or management training event (the programme). All bookings are subject to these terms and conditions and it is agreed between the Client and the Company that any contracts will be construed in accordance with English Law. Bookings can be made in writing on the booking form and sent to Premier Sailing Ltd, Fambridge Yacht Haven, North Fambridge, Essex CM3 6LU. 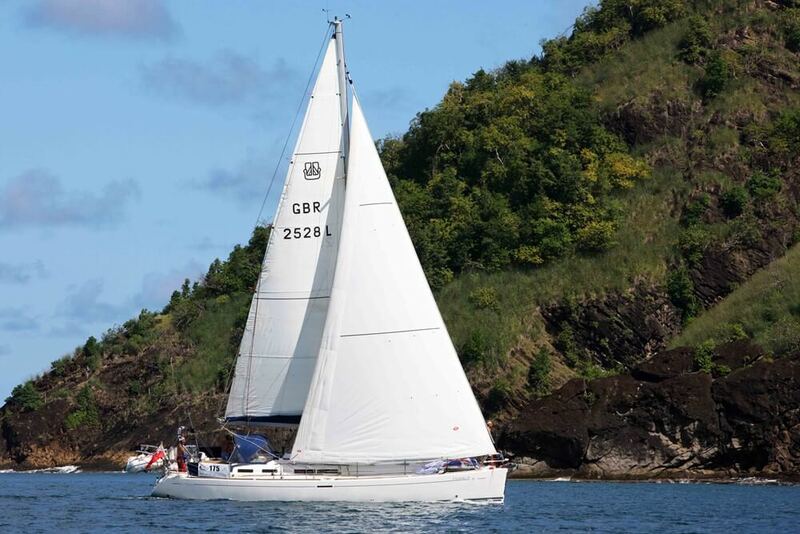 Bookings can be made by telephone (01621 744902), submitted via email ([email protected]) or via the Company’s website (www.premiersailing.co.uk). In order to reserve a place, bookings must be accompanied by a non-refundable deposit of 10% of the programme fee. The Client who signed the booking form shall be liable for all those to whom the booking form applies and in respect of whom the Client was sent an invoice. Information given by the Client via booking forms or online or via a deposit forms the basis of a contract and the Client will be accepting the booking conditions for themselves and members of their party. On receipt of the booking form the Company will send the Client confirmation of booking. Full payment less any prepaid deposit must reach the Company no later than 6 weeks prior to the start of the programme, as decided by the Company. Should a booking be made less than 6 weeks prior to the advertised programme then full payment will be required at the time of booking. The Company will not normally cancel less than 6 weeks prior to the start of the programme except for unusual or unforeseen circumstances beyond its control. In the event of cancellation, the Client will be given the choice of an alternative programme where possible. If the Client does not wish to choose an alternative programme then a full refund will be given. In the unlikely event that changes to the advertised programme occur the Company reserves the right to make such changes as required. No liability is accepted by the Company for any costs or expenses incurred by the Client in the event of changes to the programme or cancellation by the Company. Details supplied on the booking form must be accurate. The Client is advised to take out a personal travel insurance package that covers cancellation, injury and medical expenses. The policy should include cover for sailing including offshore passages for the length of the programme. The Company can recommend an insurance broker but the Client reserves the right to choose their own. The Client agrees to abide by the normal operating and safety procedures as laid down by the company in its Standard Operating Procedures. If all or part of the programme is overseas Clients will need a passport and may need a visa to enter the country where the course takes place. Clients will need to make their own visa arrangements in good time to attend the programme. Clients are responsible for travel arrangements to and from the embarkation and disembarkation points. The Client agrees to accept the authority, decisions and instructions of the Company’s Skippers, employees, agents and representatives during the programme. At all times the decision of the Skipper is final on all matters. Should the Client interfere with the well being of the Skipper or other Clients during the programme through difficult or disruptive behaviour, the Skipper has full authority to dismiss the Agitator(s) from the programme or vessel. In such event there will be no recourse to any refund. The Skipper has full authority to decide when to sail, with regard to weather conditions and the well being of the crew and vessel, or to return to port after the commencement of a passage. A decision to terminate a passage due to defects to the yacht or the state of the crew may be made at any time and the Skipper’s decision will be final. Our bespoke skippered private charters can start from any of our locations. Premier Sailing offers a range of bespoke sailing experiences, from family holidays to mile-building trips; from day sails on one of our well-appointed sailing yachts, to a summer cruise to around Ireland.